Ultimate point-blank beach and ocean views that enrich an inspired design encompassing three exceptional levels of living with a degree of finish one should expect in contemporary coastal architecture. Contributing privacy, security, low maintenance and one of only a minimal amount of Currumbin beachfront abodes, this exquisite beachouse aptly named Linga Longa sets a standard for luxurious coastline livability making you want to linger for a lot longer. The upper level of the home comprises two bedrooms, an expansive living area, bar/ kitchenette, designated office/ study area, full bathroom and separate powder room, the perfect guest or extended family holidaying retreat. The middle level offers indoor and outdoor living spaces with both formal and informal areas. Abundant amounts of space and light in the home are amplified by its high ceilings, extensive use of glass and expansive views of the ocean. A generously proportioned family and dining room sits adjacent to the stunning state of the art entertainers kitchen, with premium appliances and a gourmet butlers pantry. Accommodation comprises of a lavish master suite with walk through robe and designer ensuite bathroom. At the entry level of the home, there is garaging for 2 cars, internal access, an elegant ensuited bedroom, two-way bathroom, fully equipped laundry combining ample storage and an outside courtyard area with room for watercraft and push bikes, ideal for the soon to be completed and highly anticipated Gold Coast Oceanway bike/ walkway that will stretch from Currumbin through to Coolangatta. Simply put, an impressive property of outstanding proportions within the hub of Currumbin Village. 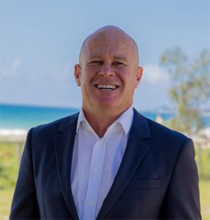 Disclaimer: Regarding the content of this information, every effort has been made to ensure that it is accurate, Currumbin Realty disclaim any implied warranty or representation about its accuracy, completeness or appropriateness for any particular purpose. This includes but is not limited to information provided by any third party. Unconditional Deposit: A minimum $10,000 deposit is required when the contract goes unconditional.